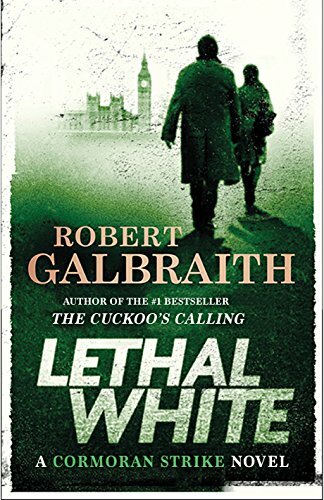 Lethal White is the fourth book in the Cormoran Strike series by Robert Galbraith (pseudonym for Harry Potter creator, J. K. Rowling). At more than 600 pages it’s a long book but it’s a book with a number of layers of story that all gel together in the end. Cormoran Strike is a British P.I. who works with his former receptionist, now his partner, Robin Ellacott. They each have ill fated romances, and Robin’s marriage to her longtime boyfriend along with Strike’s estrangement from his longtime lover are one of the story threads. In this book, there are two intertwined puzzles the pair need to unravel. One come from a mentally disturbed young man who claims to have seen a child buried during his own childhood. The other is a politician who is a paying customer. The action takes place in 2012 London just as the Olympics are about to begin when a government minister hires them to find and foil some potential blackmailers. The search for information becomes a murder investigation halfway through the book. The dead man’s past, his family and his political enemies come under scrutiny as secrets are finally revealed. The meaning of the title “lethal white” is explained midway through the book when a painting of horses that includes a doomed foal is described. “Lethal white” is a condition where the horse is born unable to digest and so lives for only a few hours. The story echoes the meaning with missing children, a miscarriage, a teenage suicide and unequal siblings. Each chapter also has a quote from Ibsen’s play Rosmerholm, a tragedy based on a past suicide with an ill-fated couple who commit suicide together at the climax. In that play, there is a mysterious white buck that appears unexpectedly. All of these bits and pieces are woven into the fabric of the complete story. Despite those layers of haunting images, the story itself is easy to follow and the characters are well drawn and intriguing. It’s not that you get buried in the echoes and images, they are added around the edges. The only thing that jars a bit is the continually missed messages between Strike and Robin. In this age of inescapable communication, it’s somewhat implausible that they should miss each other’s messages so often due to cell phones that haven’t been charged or are turned off. It’s only the personal relationship between the two detectives that suffers from these excessive missed connections. The actions for the murder mystery are all completely plausible. In the Acknowledgments the author says complexity of the plot has made this her most challenging work, but also a favorite for her. In the end, the complexity does justify the length of the book and the skill of the author keeps the reader satisfied. Don’t let the length put you off, it’s an enjoyable ride with interesting characters and an author who isn’t going to let you down.